Fresh off her ex-boyfriend's Harley and determined to remake herself, Honey Ingersoll snags a job with handsome Sam Ridley, Eureka Falls' biggest realtor. She's thrilled, but her troubles are far from over. During the sale of an abandoned farmhouse, she stumbles over the body of a young woman with big hair, silver stilettos, and a bullet hole in her chest. A few days later, she discovers uncut diamonds on neighboring farmland. The owner turns up dead soon after, and once again Honey finds the body. Sheriff Matt Rameros, who's sweet on Honey, believes the two incidents are unrelated. Honey, now a person of interest in the murders, thinks otherwise. Why else would Sam Ridley, a big Fayetteville financial concern, and a U.S. senator all have an interest in these hardscrabble properties? Honey has to find out, or she may have fled a double-wide only to end up in a jail cell. Or worse. In this new series Harrington introduces us to the spirited and self-determined Honey Ingersoll, a Eureka Falls, Arkansas, real estate agent who’s trying to rise above her poor white upbringing and make a name for herself. In this wildly entertaining and occasionally comedic series debut, we quickly discover that our heroine has a terrible dating history. Always attracting and chasing the wrong guy, Honey has to rely on her own wits and is dead set on changing this pattern. But her good intentions quickly fly out the window when she finds herself infatuated with Sam Ridley, her good-looking boss. The only complication is that he’s engaged to Lila Lott, the pretty daughter of Senator Prescott Lott. Hoping to land a quick real estate sale, Honey receives a call about the abandoned Hermann farmhouse and agrees to drive out the property and meet the potential buyer. Then much to her horror, Honey stumbles upon the body of Tallulah Bixby, who’s laying in “a puddle of blood with a bullet hole in the middle of her chest.” The flashy young woman had recently visited Ridley’s Real Estate office. Soon after this disturbing discovery Honey stumbles upon another body not far from the first location and she swiftly finds herself the main suspect in two murders. To clear her name, Honey has no other choice but to turn amateur sleuth and solve the crimes. Overall, Harrington does a splendid job of describing the absurdity of human nature and takes full advantage of her delightful characters in this quirky murder mystery. She uses their unique peculiarities to create a lively and thrilling story that is equal parts amusing, kindhearted, and engaging. 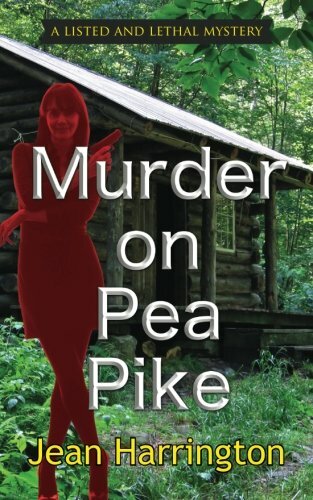 Aside from its cliché and predictable twist and turns, Murder on Pea Pike is bursting with southern charm and sultry atmosphere. A splendid series debut that won’t disappoint readers who love old school murder mysteries.